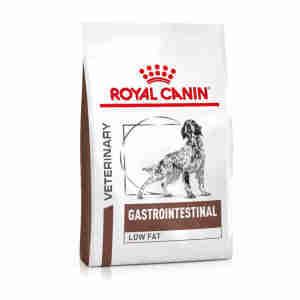 Royal Canin Canine Gastro Intestinal Low Fat has been specially blended to help relieve your dog’s tummy problems, so they can enjoy a healthy, happy life. If your dog suffers from a tummy disorder, it’s likely to make them uncomfortable, unhappy, and unable to really enjoy their food. There are a few things to keep an eye out for if you think your dog might have this kind of problem. Next time you feed your dog, watch to see if they’ve changed their eating habits. Most dogs will eat pretty much anything, and it’s quite rare they won’t finish everything you put in their bowl! If your dog doesn’t seem that interested in their food anymore, that could be a sign of a tummy problem. They could also be sick a lot, or have diarrhoea. If you do spot any of these symptoms, take your pet to the vet straight away. Some stomach problems can be very serious. The right diet is really important for any animal, so make sure you check with your vet before feeding Royal Canin Canine Gastro Intestinal Low Fat to your dog. The food is a careful mix of low fat ingredients and lots of fatty acids. These are really good for your dog’s digestion, and can help reduce and soothe any tummy problems. The ingredients are all natural too, which means there’s less chance they’ll irritate your dog’s system. Protein is a very important part of your dog’s diet. It’s usually found in meat, but some of these proteins can be bad for your dog if they have tummy upsets. The proteins in this food are specially chosen because they are gentle. What’s more, they’re already broken down into smaller parts, so your dog will be able to absorb them really easily. Dry - Rice, dehydrated poultry meat, wheat, barley, hydrolysed animal proteins, beet pulp, animal fats, yeasts, minerals, fructo-oligo-saccharides (FOS), psyllium husks and seeds, fish oil, hydrolysed yeast (source of manno-oligosaccharides), marigold extract (source of lutein). Wet - Pork liver, pork meat, maize, rice, minerals, cellulose fibre, beet pulp, taurine, yeast extract (source of mannan-oligosaccharides), fish oil, marigold extract (rich in lutein), trace elements (including chelated trace-elements), vitamins. We ordered this because of vet's recommendation. Package arrived promptly and our dog seems to love it even more than his previous type. Different dogs may respond differently. But for my dog, this is not as digestible as Hill's I/D Low Fat and my dog has lost a lot of weight on this food. Vet said these are the same but for my dog, it's clearly not the case. Buying Hill's now to do mix & match because I don't want to throw over half of a bag of this food away.